Printed from http://www.bodytalksystem.com//learn/news/article.cfm?id=766 on Apr 22, 2019. Eastern Medicine- Anatomy & Physiology of the Energetic Body. One of the more recent discoveries in neurophysiology is the discovery of the concept of the connectome. The principle behind the connectome has been an important basis of energy medicine. It underscores the understanding that the brain is not Cartesian in its makeup, and that it works as one large functional unit. Basically, the principle is that every neuron is connected to every other neuron in the brain in a complex configuration unique to every individual. It is this total functional unit that will then dictate the mechanics of what constitutes our character and personality. 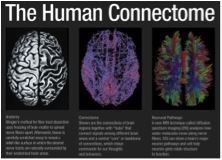 The "connectome" represents the sum total of connections between all the neurons in the brain. Therefore, it is a complex fingerprint of your identity, which reveals the differences between brains, and dictates the way the brain responds to any given situation. 2. The physical wiring of the brain, which is the physical manifestation of the energic blueprint. So far, science has focused on the physical wiring, as that is the only factor the current equipment available can detect. The term "connectome" is connect plus ome, with the ome inferring the connectome relates to the brain like the genome relates to cells. It also infers that the connectome has a strong epigenetic basis. The main protagonist of the connectome concept is Dr. Sebastian Seung , MIT Professor of computational neuroscience. He maintains that because the connectome of the human brain would be so complicated (billions of neurons), it could take another 40 years before there will be computers powerful enough to actually map it out completely. He points out that mapping out the connectome will be far more complicated than mapping the human genome. Fortunately, we do not have to wait that long for practical application of the understanding and implications of the connectome in energy medicine. Connectome research is now priority program for the National Institute of Health . The principles already discovered strongly sync with the principles of treatment used in PaRama BodyTalk. 1. The basic level is called the stable connectome. This is the circuitry that establishes the core functions of the brain that are not designed to be readily changed. This enables continuity of brain activity and essential stability in neurological processes and day to day functions of the nervous system. 2. The second level is considered unstable because it reflects our personality and many character traits. This means it would reflect our belief systems, habits, and attitudes about life. The research has confirmed what we have known for a long time in energy medicine using techniques like BodyTalk. It demonstrates that from the moment of conception, the connectome changes throughout life. The neurons adjust or "reweight" their connections by strengthening or weakening them. The neurons reconnect by creating and eliminating synapses, and they rewire by growing and retracting axon and dendrite branches. Much of this new research clearly contradicts conventional wisdom in neurophysiology - the body can create entirely new neurons, axons and dendrites and eliminate the existing redundant connections. The important thing to realize here is that this would all have to occur at the energic blueprint level first, and this is where the BodyTalk techniques can be very powerful. Dr. Seung has established the process he calls the four R's. The process of the four R's is limited and framed by genetics. However, it has been clearly established that the largest factor involved in the changes made to the connectome are the environmental factors of life events. This confirms the principles of the BodyTalk system and other holistic-based else care systems. It has been clearly established that the heart has billions of its own neurons that are far smaller, but more sophisticated in function than the brain . Obviously, the heart also has its own connectome. The function of this connectome will concur with the general functions of the heart-brain complex discussed in the "Eastern Medicine" course I am teaching starting in 2012. The concept of the connectome and gives us a very powerful focusing tool for the formulas and techniques of energy medicine systems such as BodyTalk. At this stage, it is doubtful that the innate wisdom of the body would attempt to use our techniques on the whole connectome of the brain. However, there is no reason why we can't influence functional sections of the connectome. In BodyTalk we talk in terms of coordination matrixes for various functions of the brain. For example, when we developed a skill that requires coordination, such as serving in tennis. The process of developing that skill would involve training the energic connectome which, in turn, would activate the four R's to rewire the physical brain's connectome. Sometimes, when a stressful injury occurs to the shoulder, the coordination pattern is compromised. The BodyTalk technique to restore this function involves the defragmentation of the coordination matrix. The effectiveness of the technique has been shown to be dependent upon the extent of the injury, the level of stress, and the time lapse between the injury and the treatment. Up till now, the weakness of the technique was based upon focusing purely on the section of the connectome that was damaged. Now we have a few other possibilities in approach. Obviously, in keeping with the principles of the BodyTalk system, the choice of approach will be made intuitively. 1. The defragmentation/rehab formula of the specific coordination matrix can be linked to the whole connectome at a time prior to the injury. This will make available the information necessary for rehabilitation of the energic and physical connectomes. 2. In some cases, it may be better to link to the connectome of the heart at a time "prior to the injury". 3. The formula may also include a CDRRII (a common advanced BodyTalk formula) of the relationship between the coordination metrics being treated, and the current general connectome of the brain, so that changes can be made in the main connectome to facilitate the changes occurring locally, and the ramifications of them, to the whole brain function. I have found that using the concept of the connectome and has acted as a very powerful focusing tool in my formulas that are designed to reestablish healthy brain functions. This is why I have included a section on the connectome in my new course, "Eastern Medicine" which I'll be teaching from the beginning of 2012. Please keep your eyes open for a future blog called "the holographic universe" which will add a new dimension to the understanding of the connectome. You will then see that all the connections in the connectome I like the strings of a piano. They are responsible for setting up harmonic standing waves that will holographically interact with all the other standing ways to produce a holoinformational network. This concept also adds new dimensions to the understanding of the main series covered in the "Finding Health 2" course.